Oudry, Jean Baptiste (Paris 1686 – Beauvais 1755) – Period – Bear-Baiting. Bear fighting with five hounds the one of them he has finished while another is clutched by him. Three further are coming along. Pen and brush in shaded black brown washed and heightened with a little white. 13⅝ × 21⅞ in (347 × 557 mm). On thin greyish blue laid paper old mounted on laid paper and inscribed by unknown hand as Jean Baptist Oudry. Of three vertical folds including already the mounting paper only the middle one as centerfold sharper. Rubbing marks, some small loss of paper in the outermost margins of both sides and below left. Outstanding work of great compactness reaching its enormous suspense by renunciation of as good as every trimming as known already by works of the old Dutch master. Compare, e.g., Peter Bol’s etched mainwork of a boar hunt Andresen I, 143. Contrasting to this the soft character as typical for Oudry in many cases and here supported by the paper. 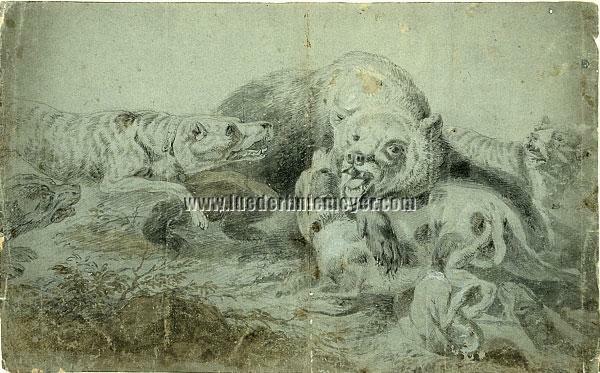 The sinous position of the bear reminding as spontanously of prints and paintings of Ridinger’s, however, less though the features of especially the hounds. Not least a sheet though whose still pending identification is good for any surprise.